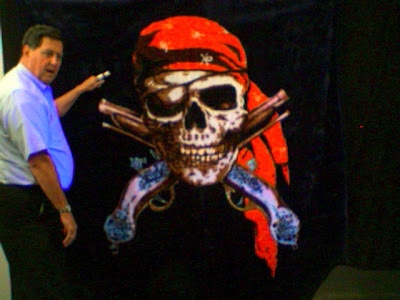 I TOOK THIS BLANKET BECAUSE I WANTED THE LARGE PAINTING ON IT (WHICH WAS CHEAP $ 35.00 ) AND PAINTED OVER IT WITH FLOURESCENT PAINT ETC. I USE THIS AS A COVER PAGE AND INTRODUCTION TO THE PIRATE MESSAGE.. ...........THIS MADE A GREAT AND DRAMATIC INTRODUCTION! WELCOME TO THE WORLD OF INVISIBLE PAINTING ! !